1907In 1907 William Foster Milne (9-23-1885 to 2-29-1920), a stonecutter, moved to Barre, Vermont from Aberdeen, Scotland, where he had been active in the early scouting movement. He is referred as the "First Scoutmaster in America" by Sir Francis Fletcher Vane. Sir Francis Vane was London Commissioner of Scouts in Baden Powell's organisation and also became President of the British Boy Scouts. 1909In 1909 "Billy" Milne learned of a small group of boys at the First Baptist Church in Barre, who were already members of the Boys Brigade, he offered them an alternative to their routine of marching and drills. By re-organizing into a new "Boy Scout Club" (Troop #1 in the United States) these scouts learned first aid, new outdoor skills and being helpful to others. 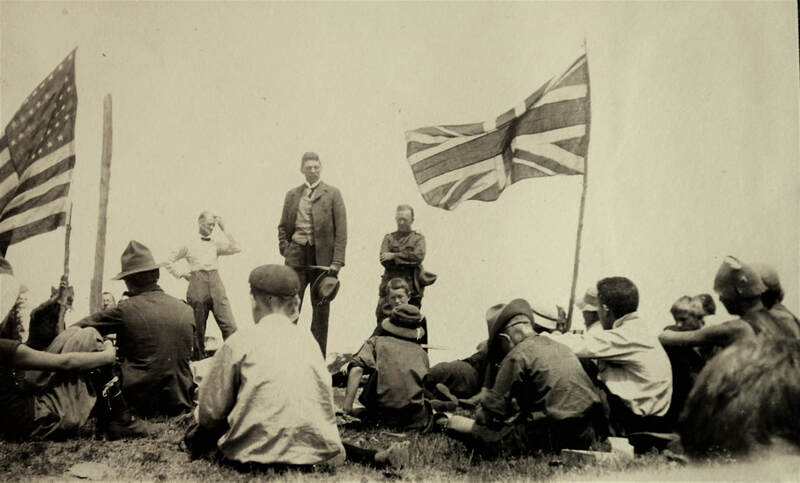 "Billy" Milne went back to his native Scotland and brought back the books and materials he needed along with a British Charter. 1910By 1910 Barre's Troop #1 joined the Boy Scouts of America. By March 1910 the Boy Scouts in Vermont had expanded to such a degree that the girls of nearby Thetford became interested. These girls along with William Chauncy Langdon, Dr. Luther Gulick and Charlotte Vedder Gulick formed the Camp Fire Girls which became the sister organization of the Boy Scouts of America on March 17, 1910. The Camp Fire Girls preceded the Girl Guides of America (now Girl Scouts of the USA) by 2 years. The original group of boys that made up Troop #1 were Charles Booth, George Booth, Gerald Brock, Carl Burgess, Earl Burgess, Dr.Stanton Burgess, Raymond Cave, William Cheeney, Clarence Geake, James Grearson, Walter Grearson, Douglas Inglis, Harry Kent, George Murray, Milton Rollins, Craig Rollins (or Ronald Cragg? ), Cecil Watt and Dr.Wallace Watt. Dr. Wallace Watt moved to Clinton County Michigan to attend college and remained there as a scout leader for his entire life. He received the Silver Beaver Award in 1981 and in 1985 a 75 year Diamond Jubilee service pin from the Boy Scouts of America. Upon his death his widow donated his Barre, Vermont Troop 1 artifacts to the Paine-Gillam-Scott Museum in St. Johns, Michigan. Dr. Watt wrote in 1985 that "Their brigade leader was a young stone cutter named Billy Milne, who returned to his native Scotland for a visit. There he heard of the new scouting movement. Milne returned by way of London, met the founder of scouting--Sir Robert Baden-Powell and became entranced with the idea. He came back to the Boys' Brigade with a handbook, neckerchiefs, cloth badges and enthusiasm about what the Scouts did in first aid, mapping, bandaging, all kinds of activities and all kinds of coping. Milne got us together on October 24, 1909 and asked if we would like to become scouts and we voted we did." Watt, 14 and his 12 year old brother both joined. "I will remember the summer of 1909 when Mr. William F. Milne, an intimate friend of our family went to visit his old home in Scotland and came back all enthused with the idea of the Boys Brigade, Sir Baden Powell's organization in Great Britain. Mr. Milne ("Billy" to one and all who knew him) started at once with his idea and by the latter part of the summer of 1909 had formed a troop of Boy Scouts with about a dozen boys from the Sunday School Class of the First Baptist Church, Barre, Vermont, Mr. James Grearson, teacher. I was one of the first to receive my Scout Certificate. All honor to the memory of William F. Milne, who started this wonderful movement for boys and who gave unstintingly of his time and energy to make it grow to the fine organization it is today." 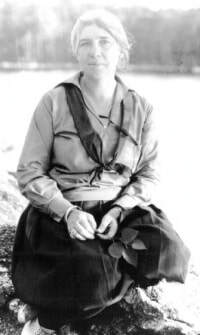 "In response to several requests from people in this community interested in Scouting I am going to try and give a brief account of the organization as it first originated her in Barre in the year 1909. As I now recall a group of boys from our First Baptist Church headed by a young man just over from the "old country" and already interested in scouting as it was then known in England, decided to form a troup and in the month of October of the year 1909 we organized such a troup, with this young man William Foster Milne as our leader. Our meetings were held regularly and well attended by about twelve to fourteen members. This number grew steadily and our troup increased both in interest and in numbers. From time to time we would put on public exhibitions in order to advance the idea of scout activities and in this way the scouting movement grew in our city so that in a short time other troups in several churches were formed. Up to this time, as I now recall, we had no recognition from any general headquarters here in America, all our material having comefrom England upon the written request of the above mentioned Mr. Milne. As time went on and the local merchants in particular noticed our progress and at once became interested. So much so that one of them, The Homer Fitts Co. put a large traverse sled on exhibition and also as a prize for any scout troup obtaining the greatest number of votes. Our troup went after this prize and came out victorious. Time went on and finally we were able to have our certificates, etc. direct from headquarters in New York. I have here before me a certificate showing where I was officially taken into the Scout brotherhood on Oct. 31, 1911, about 2 years after we had already been doing scouting but not under any official American headquarters. During all this period I was the assistant scoutmaster to our troup. In the winter of 1911 the Y.M.C.A. of this state held a boys conference at Ludlow and our troup was one of the largest to send delegates, or should have said had the largest number of scout delegates present, nearly all our troup attending. Among our members now living are Mr. Douglas Inglis of Worcester, Mass., Mr. Raymand Cave of Watertown Mass., Dr. Stanton Burgess of Boston Mass., Mr. George Murry of Quincy Mass.,Mr. Ronald Cragg, last known address in Pennsylvania, James Grearson Sr. of this city, Mr. William Cheeney of Northfield, Vt. Other members of our troups I now recall their names ere Carl and Earl Burgess, brothers of the above mentioned doctor. Charles and Geo. Booth, Clarence Geake, and Mr. Walter Grearson deceased brother of the above Mr. Grearson. Many happy memories are brought to my mind as I write these few lines and it hardly seems possible that nearly 32 years have passed since we were lads and enjoying the great out of doors, hiking, pitching tents, building fires and camping. As the old saying "Those were the happy days" and may god grant that scouting today may mean as much to the lads now as it did to us then. May Scouting be the uppermost in the minds of our youth of today." "A beautiful Rock of Ages monument in front of the Baptist church on Washington Street in Barre now records the formation of that troop as the first in the country. This was before the Boy Scouts were charted by the United States Congress, so Billy Milne was free to run he troop according to his own rules. Fortunately, I was permitted to join even though I was only nine. The minimum age for Boy Scouts was set at twelve soon after. The Boy Scout movement was dedicated to teaching boys of immature years the basic principles of good conduct, good citizenship, crafts, the skills of outdoor life and self discipline. It has been a great force for good in the past in this country, and Billy Milne was a born leader. He understood boys, and we admired, respected and loved him. In the basement of the Baptist church, he taught us the meaning of citizenship, patriotism, moral conduct, and the proper attitude toward others. Billy Milne also taught us the methods and fun of outdoor camping. He took us on overnight trips and taught us about the woods, the trees, the sun, the sky, and the interrelationship of these things to each other and to God's plan. Shortly after the Barre Baptist Boy Scout Troop was organized, legislation was passed in Congress to establish the Boy Scouts of America on a national basis and to provide a formal method of granting charters to individual clubs around the country. At that time or shortly thereafter, a troop was formed in my own church, the Hedding Methodist church in Barre, and I joined that troop." Visited Camp Abnaki in June, 1910, and The Barre Boy Scout Club then joined the BSA (Boy Scouts of America), which formed in 1910. ​In 1910, young girls in Thetford, Vermont, watched their brothers, friends, and schoolmates – all Boy Scouts – practice their parts in the community's 150th anniversary, which would be celebrated the following summer. The pageant's organizer, William Chauncey Langdon, promised the girls that they, too, would have an organized role in the pageant, although no organization such as Boy Scouts existed then for girls. Langdon consulted with Mrs. Charles Farnsworth near Thetford. Both approached Luther Halsey Gulick M.D. about creating a national organization for girls. Gulick introduced the idea to friends, among them G. Stanley Hall, Ernest Thompson Seton, and James West, executive secretary of the Boy Scouts. After many discussions and help from Gulick and his wife Charlotte, Langdon named the group of Thetford girls the Camp Fire Girls.